Almost every critic acknowledges the Sinfonia Domestica as a problem work. Most believe its failure due to a wide discrepancy between the intimate program (a day in the life of Strauss, wife Pauline, and child Bubi) and the gargantuan music that the program inspired. Strauss, I believe, sufficiently answered his critics by stating that the program was only the stimulus; the music alone counted. For this reason, he would probably have sympathized with a view of the work as a symphonic development of three principal thematic groups. Yet large stretches of the music are so obviously descriptive (the clock striking seven at the beginning and close of the night sections, for example, as well as that section itself) that they make little sense without the programmatic idea of Husband, Wife, and Infant. Strauss made the famous remark that he found himself as interesting as Napoleon and Alexander. Unfortunately, most of us don't share that interest, at least to the point of how often he brushed his teeth, and the rather trivial program intrudes on those sections which really can stand by themselves. Strauss also seriously miscalculates the finale, which goes on about twelve pages too long, working over old ground yet again. I've found the trick to liking this work in conveniently forgetting the program at certain points and recalling it for others, as in the "quarrel" sections between husband and wife. The work overflows with so much imaginative, exuberant music (some of which looks forward to Salome and Rosenkavalier) that a good performance should carry you through the weak spots. Reiner offers a fine, sturdy account. In the quiet, delicate sections, the music takes on a shimmering transparency (parts of the Landler; the remarkable quartet, following the lullaby, for flute, oboe, clarinet, bass clarinet, and, later strings). However, Reiner tends to come down too heavily in the loud sections (for example, the baby's cries in the scherzo and the first climax of "Doing and Thinking" on the wife's themes). Predictably, the Adagio gives him the most trouble (as it does everyone else), although he's wonderful on the tender passages of the love scene. Still, the passionate sections lack the coherence and point of Szell's performance. "Dreams and Worries" goes along well enough, but to a large extent Reiner marks time until the finale, where he rediscovers his interest in the piece. The fugue moves with great rhythmic verve while the polyphony remains clear. Most impressively, Reiner demonstrates how to build climaxes and how to fall away – an art that seems to have eluded most present-day conductors. Even Strauss' characteristically abrupt switches to new ideas don't break the overall momentum. The first grand climax of the fugue (what Del Mar refers to as "the Apotheosis of Bubi") rings out magnificently. Reiner tries to solve the problem of the finale's second peroration (the entrance of the massed horns) by simply ignoring it, letting the built-up energy of the movement take him as far as it can. It carries him pretty far, but not far enough: he runs out of gas with two and a half minutes left. He tries unsuccessfully to punch things up, when he should be finding the next curve. A notable hiss blemishes generally acceptable recorded sound. Further, in what seems an effort to compensate, the engineers have poured in too much bass. Nevertheless, the sonic profile should not bother anyone but the fussiest audiophile. The music-making relegates such critiques to the realm of the picky. No one penetrated so deeply into the work as Szell. The absence on CD of this great conductor's recorded output mystifies me. This 1974 LP re-issue probably waits in some second-hand record shop and definitely is worth seeking out. Not only do you hear details you've missed in every other reading, but also Szell captures the elusive, idiosyncratic spirit of the piece. Strauss referred to the Sinfonia as his "Pastorale." Although that remark more accurately describes the later Alpensinfonie, Szell allows you to see its point: the lively humor, the folk character of many passages (including a couple of rather Mahler-like Landler; the idiom lingers from Feuersnot), the storms of the wife, the meditations by the river of dreams. Szell gives almost every section its full weight and a tremendous sense of propulsion. He brings out so much of the personality of the three main figures, you begin to regret that the Bing era cut short his operatic career. His handling of the "Love Scene" is probably the most graphic on record. Nevertheless, he falters at two points: the second development of the "Doing and Thinking" section, probably the weakest part of the work; "Dreams and Worries," some of the most Impressionistic pages in all Strauss. Here, he pushes too hard. You want the music to relax, to ease into serenity before the eye-popping, double-fugue fireworks of the finale. Most importantly, Szell brings to the piece supremely patrician taste – the taste of an artist, rather than some pettifogging arbiter. He doesn't keep the lid on, but he never strays into bombast, either – no mean feat in the finale's second major peroration (where the horns move into heights inhabited by Sherpa guides). He brings to mind Tovey's famous proposition: "How is it that the great masters never have any difficulty in getting out of pitfalls? Answer: because they never fall into one." Indeed the entire finale for once doesn't overwhelm you with a vulgar pile-up of orchestral whipped cream. Under Szell, it charms you with Haydnesque high spirits and wit. Who knew? The sound is the dry acoustic CBS usually gave the Cleveland Orchestra (when they switched labels, their recorded personality suddenly warmed up), but it doesn't reduce the stature or one's enjoyment of the performance. Kempe treats the work as a gemutlich piece of Wilhelminiana. Strauss, in this reading, becomes the happy bourgeois – fine by me, since I'm a bourgeois myself. Kempe overdoes nothing, but, then again, nothing soars either. 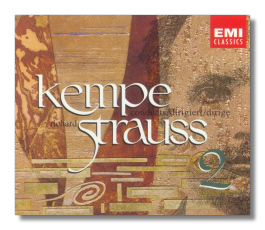 Like Reiner, Kempe succeeds most happily in the folk-dance sections, and, unlike Reiner, he manages to ride the natural pulse of the music throughout. The night music of the Adagio is a bit too comfortable. I miss the nobility of "Doing and Thinking." The "Dreams and Worries" section, although played with great refinement, doesn't quite come off as a quiet phantasmagoria, to the extent that it does in other readings. Still, the glory of this account is the finale, with the problem of the second peroration perfectly solved. If it doesn't blaze like Reiner's, it doesn't falter either. The Dresden State Orchestra plays beautifully for Kempe, giving him a bright tone and a clear texture throughout. I miss the weight of the Chicago strings, however. I wonder also the extent to which this clarity comes from the tweak of a control knob. The solo winds sound way to the fore of the rest of the ensemble and the tone is a bit too bright (flaws often found in EMI engineering). Nevertheless, at this point I'm quibbling.